Can I put two 8 inch rounds in the fridge to cool faster? Hi Andrea, I would not recommend cooling cakes in the refrigerator. It may cause the cakes to get soggy and stick to the sides of the pans pretty well. This would make them harder to remove from the pans. Cool your cakes on a rack so that the cakes are slightly up off the counter surface or like the photo on top of the stove , I sometimes use the burner racks. This way the air can circulate around them and cool them slowly. 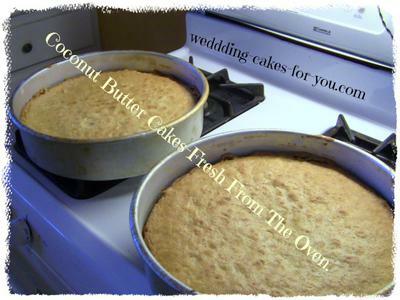 Once they are cooled you can run a knife or spatula around the edges and then flip the cakes over onto cardboard rounds. Let them cool completely and wrap in plastic. Then you can refrigerate or freeze them. What would cause an angel food cake to fall out of the pan when inverted for cooling? I am sorry but I am stumped on this question. My first thought is that the cake itself didn't bake up properly and shrunk enough to fall out of the pan. Hope fully one of my readers will come along and give you a better answer. I made an angel food cake for Easter yesterday and mine fell out also. I baked it for 45 minutes in a tube pan. I tried inverting it over a wine bottle and the insides fell all over the cutting board.The outsides stuck to the pan. I have never seen anything like this. I did put two cans of pie cherries into the cake when I was making the cake. Could it be that the fruit was too heavy for the cake to set up properly? Hi Bill Yes the fruit is the culprit. Too much liquid ingredients. If you make a change to the liquid then you have to balance it with the dry ingredients. I would not mess with the original recipe of an angel cake as the cake is already very delicate. How long to cool before decorating? I want to make my husband a surprise congratulatory cake while he is at work, so I would want to make it and decorate the same day. Is that possible with fondant? ANSWERHi Hayley, Sure you can bake and decorate a cake the same day. I assume it will be a small cake? Bake your cake layers as early as possible in the morning. Once they are cooled to room temperature, place them onto cardboard rounds and wrap them in plastic wrap. *To speed things up a bit you can put the warm cakes (not hot cakes-let them cool halfway at least) un wrapped into the freezer for a 1/2 and hour or so. Once the cakes are wrapped in plastic wrap, place them into the freezer, or back into the freezer if you cooled them in there. While the cakes are chilling, make your filling and buttercream frosting. You will need to coat the cake in icing before the fondant goes on. If you do want to make your own fondant there is a marshmallow fondant recipe at the that is very easy but also very messy. Or you may want to make your own fondant try a traditional sugar paste or the marshmallow version, which is on the same page. Here is a perfect post for you that has a lot of helpful information. Hope that helps you out with your surprise cake for your husband.